Little is known about the impact of various phosphate binders on the skeletal lesions of secondary hyperparathyroidism (2°HPT). The effects of calcium carbonate (CaCO3) and sevelamer were compared in pediatric peritoneal dialysis patients with bone biopsy-proven 2°HPT. Twenty-nine patients were randomly assigned to CaCO3 (n = 14) or sevelamer (n = 15), concomitant with either intermittent doses of oral calcitriol or doxercalciferol for 8 mo, when bone biopsies were repeated. Serum phosphorus, calcium, parathyroid hormone (PTH), and alkaline phosphatase were measured monthly. The skeletal lesions of 2°HPT improved with both binders, and bone formation rates reached the normal range in approximately 75% of the patients. Overall, serum phosphorus levels were 5.5 ± 0.1 and 5.6 ± 0.3 mg/dl (NS) with CaCO3 and sevelamer, respectively. Serum calcium levels and the Ca × P ion product increased with CaCO3; in contrast, values remained unchanged with sevelamer (9.6 ± 01 versus 8.9 ± 0.2 mg/dl; P < 0.001, respectively). Hypercalcemic episodes (>10.2 mg/dl) occurred more frequently with CaCO3 (P < 0.01). Baseline PTH levels were 980 ± 112 and 975 ± 174 pg/ml (NS); these values decreased to 369 ± 92 (P < 0.01) and 562 ± 164 pg/ml (P < 0.01) in the CaCO3 and the sevelamer groups, respectively (NS between groups). 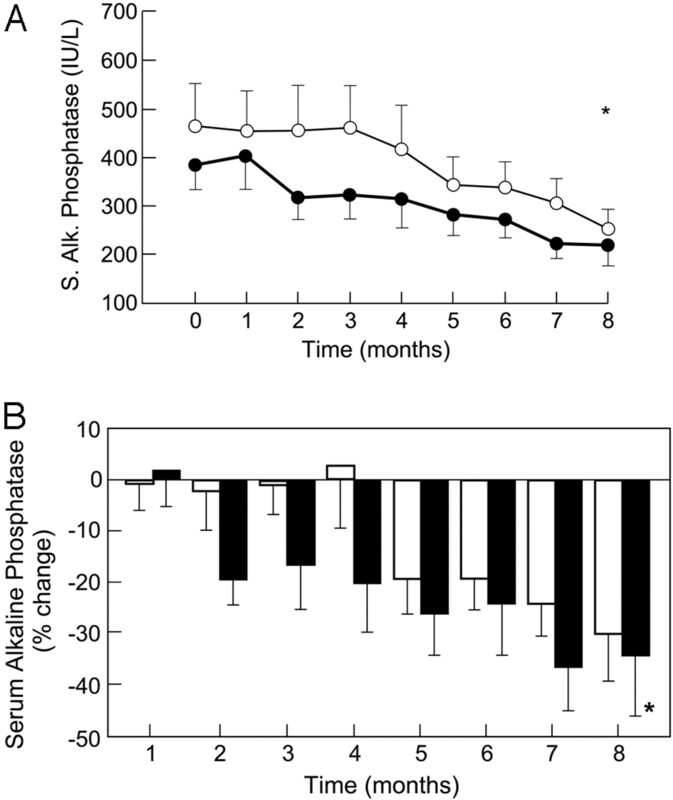 Serum alkaline phosphatase levels also diminished in both groups (P < 0.01). Thus, treatment with either CaCO3 or sevelamer resulted in equivalent control of the biochemical and skeletal lesions of 2°HPT. Sevelamer, however, maintained serum calcium concentrations closer to the lower end of the normal physiologic range, thereby increasing the safety of treatment with active vitamin D sterols. Calcium-containing phosphate-binding agents and active vitamin D sterols have been widely recommended for the control of hyperphosphatemia and the prevention of secondary hyperparathyroidism (2°HPT) (1). The administration of such compounds, however, contributes to the development of frequent episodes of hypercalcemia, hyperphosphatemia, adynamic osteodystrophy, and vascular calcifications (2–8). Indeed, current evidence indicates that abnormalities in mineral metabolism, as well as the therapeutic agents that are most widely used for the treatment of 2°HPT, play a role in the development of vascular calcifications in adult and pediatric patients with ESRD (2,4,5) and may contribute to decreased overall survival in ESRD (9–11). However, untreated 2°HPT causes significant morbidity, including severe bone deformities and growth retardation in children (12). The availability of effective calcium-free, metal-free phosphate-binding agents, such as sevelamer (13–15), combined with new active vitamin D sterols, such as doxercalciferol (16,17), has widened the margin of safety for the treatment of 2°HPT. Although these agents can effectively control serum phosphorus and lower parathyroid hormone (PTH) levels, little is known about their effects on the skeletal lesions of 2°HPT. Thus, this study was undertaken to compare prospectively the effects of calcium carbonate and sevelamer on the control of the biochemical and skeletal indices of 2°HPT during therapy with either calcitriol or doxercalciferol in pediatric patients who are treated with peritoneal dialysis. Patients who were included in this study were participants in an ongoing clinical trial designed to determine whether the use of less calcemic vitamin D sterols, such as doxercalciferol and sevelamer, modifies the skeletal response during treatment of 2°HPT. Potential subjects for the study were aged 2 to 20 yr, were undergoing continuous cycling peritoneal dialysis (Table 1), and had serum PTH levels >400 pg/ml, as determined by first-generation immunometric assay (18), because it corresponds to bone biopsy findings of 2°HPT (19). Patients were eligible for randomization when they had bone histomorphometric evidence of 2°HPT as previously defined (19). Exclusion criteria were documented history of poor compliance; parathyroidectomy within the previous 12 mo; and treatment with prednisone, other immunosuppressive agents, or recombinant human growth hormone while undergoing dialysis. Fifty-two patients were identified as potential candidates for the study, and bone biopsies were performed in 45 patients; 42 of them were randomly allocated for 8 mo to one of the four treatment arms using a 2 × 2 longitudinal factorial study design: (1) Calcitriol + calcium carbonate (n = 10), (2) doxercalciferol + calcium carbonate (n = 11), (3) calcitriol + sevelamer (n = 11), and (4) doxercalciferol + sevelamer (n = 10). The primary end point was bone formation rate determined by bone biopsy after double tetracycline labeling, and the secondary end points were serum levels of calcium, phosphorus, alkaline phosphatase, PTH, and the dose of vitamin D sterols. Twenty-nine patients completed the study, and factorial analysis provided no evidence of treatment interaction between the two vitamin D sterols; therefore, comparisons are reported only between the two phosphate binders, irrespective of the type of vitamin D analog used (Table 1). Biochemical determinations of serum total calcium, phosphorus, total alkaline phosphatase, and PTH levels were obtained at initial bone biopsy and at 2- to 4-wk intervals during the course of the study. Two separate PTH determinations were performed at baseline and after withholding therapy with calcitriol for 4 wk before biopsy; values were 962 ± 87 and 920 ± 79 pg/ml (NS), respectively, in the 29 patients included in the study. All monthly biochemical measurements were performed 14 to 16 h after the administration of calcitriol or doxercalciferol, as described previously (3). Bone biopsies were repeated after 8 mo of treatment. Quantitative histomorphometry of bone was carried out as described previously (20), and terminology established by the Nomenclature Committee of the American Society of Bone and Mineral Research was used (21). A qualitative score for marrow fibrosis was developed: 0, absent; 0.5, small amount of peritrabecular fibrosis; and 1, marrow fibrosis. Patients were admitted to the UCLA General Clinical Research Center, and bone biopsies were obtained from the anterior iliac crest using a modified Bordier trephine needle after double tetracycline (20). The UCLA Human Subjects Protection Committee approved the study protocol, and informed consent was obtained from each patient and from either parents or guardian, where appropriate. Calcitriol or doxercalciferol were given orally thrice weekly—Mondays, Wednesdays, and Fridays—at bedtime to minimize the impact of vitamin D sterol on intestinal calcium and phosphorus absorption (22). The initial doses were based on PTH levels (19): when values were <600 pg/ml, the doses of calcitriol and doxercalciferol were 0.5 and 2.5 μg, respectively; when PTH levels were >600 pg/ml, the initial doses were 1.0 and 5.0 μg/dose for calcitriol and doxercalciferol, respectively. Target values for serum calcium levels were between 8.4 and 10.2 mg/dl and for serum phosphorus concentrations were 4.0 to 6.0 mg/dl. The doses of doxercalciferol and calcitriol were titrated upward in units of 0.5 μg/dose for calcitriol and 2.5 μg/dose for doxercalciferol every 4 wk to achieve a target PTH level between 300 and 400 pg/ml (3), when serum calcium and phosphorus levels were <10.2 and 6.0 mg/dl, respectively. Once PTH levels fell below 500 pg/ml but remained above the target range of 300 to 400 pg/ml, the dose of vitamin D was kept constant when serum calcium and phosphorus levels were below or at target levels. The initial dose of calcium carbonate was based on the previous prescription, and the 1250-mg tablets (equal to 500 mg of elemental calcium) were given with each meal and snack (23,24). The initial dose of sevelamer had a phosphate-binding capacity that was similar to that of the previous dose of calcium carbonate initially with the 403-mg capsules and subsequently 800-mg capsules when they became commercially available, as previously shown (15). In patients who were treated with sevelamer, 1000 mg of elemental calcium was added at bedtime when serum calcium levels were <8.2 mg/dl. Nutritional intake was determined monthly by 3-d diet diaries (25). The dialysate calcium concentration was 2.5 mEq/L (Dianel; Baxter, Deerfield, IL). Patients were withdrawn from the study when they had persistent hyperphosphatemia, values >7.0 mg/dl for a period of 3 consecutive months despite increasing the frequency of clinic visits to improve compliance. Additional withdrawal criteria included kidney transplantation, change in dialytic modality, and psychosocial factors as determined by medical staff. Serum calcium, phosphorus, and alkaline phosphatase levels were determined using a Technicon Autoanalyzer II. Serum PTH concentrations were determined by first-generation immunometric assay (18) (Nichols, San Juan Capistrano, CA) and measured by the UCLA Hospital laboratory. The overall study is a randomized, longitudinal, factorial trial. The primary outcome was bone formation rate as determined at baseline and at the eighth month of the study. Other outcomes, such as serum calcium, phosphorus, alkaline phosphatase, and PTH, were measured monthly throughout the study. All measurements and the corresponding monthly percentage changes from baseline for each group were summarized as mean ± SEM. Scatter plots of the outcomes versus time were used to analyze the data. Baseline determinations between the two groups were compared using t test. Two-way ANOVA method for repeated measurement was used to compare the differences between and within groups. Treatment, time (month), and treatment × time interaction were included in the model. Because of the dependence of the measurements obtained from the same patient, we assume that the covariance of the error term of this model is a block diagonal matrix: Each block corresponds to a single patient and has a compound symmetric structure. The results of the descriptive analyses and the scatter plot demonstrated a difference in the data from the initial 4 mo to the last 4 mo. Therefore, the mean values for each treatment group in the two periods were estimated, and comparisons between each 4-mo period were performed. SAS software was used to perform the statistical analysis. All tests are two sided with significance level at 0.05. This α level was not adjusted for multiple comparisons. The age, gender distribution, primary renal disease, duration of dialysis before the beginning of the study, and allocation to therapy with calcitriol or doxercalciferol did not differ for patients who received calcium carbonate or sevelamer (Table 1). The number of patients in each group who had previously received a kidney transplant was also similar as well as the dialysis prescription (Table 1). Baseline static and dynamic bone variables did not differ between the two groups (Table 2). The skeletal lesions of 2°HPT improved after 8 mo of treatment in both groups. The vast majority of patients had initial bone histologic findings of overt osteitis fibrosa in both groups, and the extent of marrow fibrosis was less in both groups (P < 0.04, Fisher test) at follow-up examination, but eroded perimeter fell only in patients who were treated with calcium carbonate (Table 2). Bone histomorphometric evidence of increased bone formation diminished in both groups. Osteoid area, osteoid perimeter, and osteoid seam width each fell substantially, but remained above the normal reference range (Table 2). Moreover, the extent of mineralizing surface within cancellous bone decreased as judged by the uptake of tetracycline into bone. Initial bone formation rates were 1782 ± 384 and 1141 ± 161 μm2/mm2 per d in the calcium carbonate and sevelamer groups, respectively (NS), and values decreased by 53 ± 11% (P < 0.01) and 49 ± 7% (P < 0.01), respectively (Table 2); only one patient in the sevelamer group developed adynamic bone. Thus, indices of bone formation rates were within the normal range in 78 and 67% of the patients who were treated with calcium carbonate and sevelamer, respectively, on final bone biopsies (Figure 1). Individual changes in bone formation in patients who were treated with calcium carbonate (•) and sevelamer (○). The dotted area represents the range of bone formation rate for children and adolescents with normal renal function (49). Baseline serum phosphorus levels were 5.9 ± 0.4 and 5.6 ± 0.3 mg/dl in patients who were started on calcium carbonate and sevelamer, respectively (NS). Throughout the course of the study, overall serum phosphorus levels were 5.5 ± 0.1 and 5.6 ± 0.3 mg/dl (NS) in the calcium carbonate and sevelamer groups, respectively (Figure 2). The number of hyperphosphatemic episodes (serum phosphorus >6.0 mg/dl) were 34 and 43 in the calcium carbonate and sevelamer groups, respectively (NS). The dietary phosphorus intake averaged 766 ± 41 and 815 ± 43 mg/d for patients who received calcium carbonate and sevelamer, respectively (NS). Serum phosphorus levels during treatment with calcium carbonate (▪) and sevelamer (□). The dotted line represents the upper limit of normal serum phosphorus as defined per protocol (see Materials and Methods). Initial serum calcium levels were 9.0 ± 0.2 and 9.0 ± 0.2 mg/dl for patients who were given calcium carbonate and sevelamer, respectively (NS; Figure 3). Serum calcium levels rose progressively in patients who were given calcium-based binders, and values remained above pretreatment levels. During the initial 4 mo, the estimated mean serum calcium levels were 9.5 ± 0.2 mg/dl (P < 0.01 compared with baseline), and values increased to 9.8 ± 0.2 mg/dl (P < 0.001 compared with baseline) during the final 4 mo; the peak serum calcium level was 9.9 ± 0.3 mg/dl at the seventh month (Figure 3). 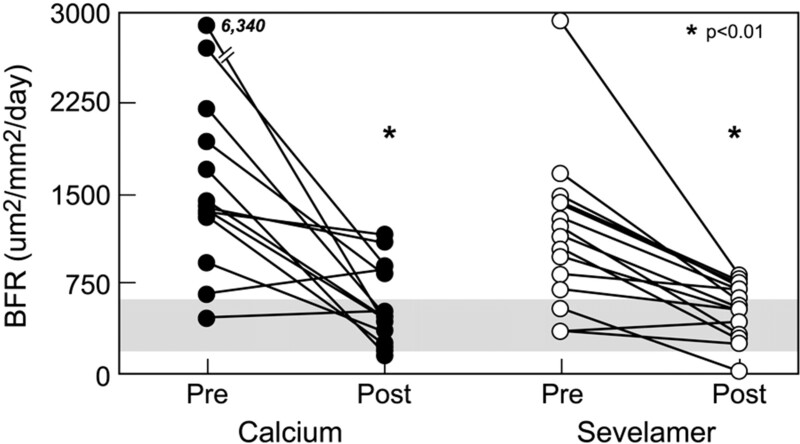 In contrast, serum calcium concentrations did not rise from baseline values during treatment with sevelamer (Figure 3). Indeed, the estimated mean serum calcium levels were 8.9 ± 0.2 and 9.1 ± 0.2 mg/dl (NS) during the initial 4 and final 4 mo of the study, respectively. Throughout the study, overall calcium levels were 9.6 ± 0.1 and 8.9 ± 0.2 mg/dl (P < 0.01) in the calcium carbonate and sevelamer groups, respectively. In the calcium carbonate group, serum calcium concentrations overall increased by 7 ± 2% (P < 0.003) from pretreatment levels, whereas the percentage change with sevelamer was only 0.3 ± 2.3% (NS; P < 0.04, differences between the two groups; Figure 3). Serum albumin levels were 4.0 ± 0.1 and 3.9 ± 0.02 g/dl in the calcium carbonate and sevelamer groups, respectively (NS). There were 22 episodes of hypercalcemia (>10.2 mg/dl) in patients who were treated with calcium carbonate and five in those who received sevelamer (P < 0.01). (A) Serum calcium levels during treatment with calcium carbonate (▪) and sevelamer (□). (B) Changes in serum calcium levels shown as percentage of baseline values during treatment with calcium carbonate and sevelamer. *P < 0.01, difference from baseline in the calcium carbonate group; †P < 0.01, differences between both groups throughout the course of the study. Pretreatment values for the serum calcium-phosphorus ion product were 54 ± 4 and 50 ± 4 mg2/dl2 (NS) in the calcium carbonate and sevelamer groups, respectively, and throughout the study, overall levels were 53 ± 2 and 51 ± 1.9 mg2/dl2, respectively (NS). However, the estimated mean calcium-phosphorus ion product increased from 51 ± 2 to 55 ± 2 mg2/dl2 (P < 0.02) during the last 4 mo in patients who were treated with calcium carbonate. Baseline serum total bicarbonate levels were 23 ± 0.9 and 24 ± 0.8 mEq/L in the calcium carbonate and sevelamer groups, respectively, and values throughout the study were 24 ± 0.5 and 22 ± 0.5 mEq/L for both groups (P < 0.03), but values did not differ from baseline in patients who were treated with sevelamer. The number of patients who received oral bicarbonate therapy did not differ between the two groups (χ2 = 2.40; NS). Initial serum PTH levels were 980 ± 112 and 975 ± 174 pg/ml (NS) in patients who were treated with calcium carbonate and sevelamer, respectively, consistent with severe 2°HPT (19), and final levels were 369 ± 92 (P < 0.01) and 562 ± 104 pg/ml (P < 0.01), respectively (NS, between groups; Figure 4). Although PTH levels decreased in both groups, the rate of decline was greater during the initial months of the study in the calcium carbonate group (Figure 4). Indeed, the percentage change in PTH from pretreatment values was 29 ± 9% (P < 0.002) during the first 4 mo in the calcium group, and it increased to 46 ± 9% (P < 0.001) during the final 4 mo. In contrast, PTH decreased by only 6 ± 9% (NS) during the initial 4 mo with sevelamer, and values diminished by 33 ± 9% (P < 0.001) during the final follow-up period (Figure 4). (A) Serum parathyroid hormone (PTH) levels during treatment with calcium carbonate (•) and sevelamer (○). (B) Changes in serum PTH shown as percentage from baseline values during treatment with calcium carbonate (▪) and sevelamer (□). *P < 0.01, differences from baseline values within each of the groups. Baseline serum total alkaline phosphatase levels were 383 ± 49 and 466 ± 85 IU/L (NS) in the calcium carbonate and sevelamer groups, respectively, and final values diminished within each group: 220 ± 42 (P < 0.02) and 254 ± 40 IU/L (P < 0.02), respectively (Figure 5). However, the rate of decline expressed as percentage change from baseline differed, as described previously with PTH levels. Values decreased by 14 ± 7% (P < 0.05) in the initial 4 mo and by 31 ± 7% during the last 4 mo with calcium carbonate (Figure 5). In contrast, values remained almost unchanged during the initial 4 mo with sevelamer, and levels subsequently decreased by 22 ± 7% (P < 0.01). (A) Serum total alkaline phosphatase levels during treatment with calcium carbonate (•) and sevelamer (○). (B) Changes in serum total alkaline phosphatase levels shown as percentage from baseline values during treatment with calcium carbonate (▪) and sevelamer (□). *P < 0.01, differences from baseline values within each of the groups. The average dose of elemental calcium from the calcium-based binders and the dietary calcium intake were 3.0 ± 0.2 and 560 ± 41 mg/d, respectively. The dose of sevelamer was 9.7 ± 0.2 g/d with a corresponding dietary calcium intake of 520 ± 36 mg/d. Three patients who were treated with sevelamer required calcium supplements during weeks 4 to 12. The overall dose of calcitriol averaged 1.5 ± 0.2 μg/dose (55 ± 10 ng/kg per dose) for patients who were treated with calcium carbonate and 1.9 ± 0.2 μg/dose (NS; 45 ± 28 ng/kg per dose) for those who were given sevelamer. In patients who were treated with calcium carbonate, the dose of calcitriol during the first and second periods of the study were 1.2 ± 0.3 and 1.6 ± 0.3 μg/dose, respectively (NS). In contrast, during therapy with sevelamer, the dose of calcitriol could be increased from 1.6 ± 0.3 to 2.2 ± 0.3 μg/dose (P < 0.02), respectively, during both study periods. The dose of doxercalciferol for the full 8 mo of the study was 4.9 ± 1.8 μg/dose (154 ± 27 ng/kg per dose) for patients who were treated with calcium and 7.0 ± 1.5 μg/dose (194 ± 33 ng/kg per dose; NS) for those who were given sevelamer. During therapy with calcium carbonate, the doses of doxercalciferol were 5.6 ± 1.9 and 4.2 ± 1.9 6 μg/dose during the initial and final periods of the study (NS). As with calcitriol, the dosage of doxercalciferol when used in combination with sevelamer could be increased from 5.4 ± 1.6 to 8.8 ± 1.6 μg/dose (P < 0.02) during the study. The results of this prospective, randomized, clinical trial demonstrated that combining therapy with active vitamin D analogues and either calcium carbonate or sevelamer markedly improved the biochemical and skeletal lesions of 2°HPT. Indeed, serum PTH and alkaline phosphatase levels decreased and indices of bone formation and turnover had reached the normal range in the majority of all patients by the end of the study. Both phosphate-binding agents controlled serum phosphorus levels equally well, but serum calcium concentrations and the calcium-phosphorus product increased progressively during treatment with calcium carbonate; in contrast, serum calcium levels remained unchanged with sevelamer therapy as previously shown (3,24,26). Thus, either treatment protocol can lead to effective control of the biochemical and skeletal lesions of 2°HPT. However, while controlling serum phosphorus levels with sevelamer, serum calcium concentrations remained closer to the lower end of the physiologic range as recently recommended (27), thereby allowing a progressive increase in the dose of active vitamin D sterols. Previous reports demonstrated that calcium-based phosphate binders and sevelamer can both adequately control serum phosphorus levels in patients who are treated with hemodialysis (14,15,24,28), and our results extend these findings to pediatric patients who undergo peritoneal dialysis. However, our trial differed in that only patients with biochemical and skeletal evidence of moderate to severe 2°HPT were included and bone histomorphometric indices were used as the primary end point. The skeletal lesions of 2°HPT improved in most patients, as indicated by diminished osteoblastic and osteoclastic activity, documented by decrease in bone formation, the extension of resorption surface, and the degree of marrow fibrosis. Indeed, indices of bone formation and turnover reached the normal range in almost 75% of the patients, and only one patient developed evidence of adynamic bone disease. Overall, the magnitude of reduction in bone formation did not differ between groups, but the decline in bone resorption was greater in the calcium-treated group, which could be consistent with a PTH-independent role of calcium in the regulation of osteoclastic activity (29). The prevention of adynamic bone has important clinical implications, because a substantial proportion of pediatric patients who were treated with calcitriol and calcium-based binders developed this lesion associated with more frequently elevated serum calcium levels and growth retardation (3,26,30). Furthermore, adynamic osteodystrophy was reported to be associated with greater degree of arterial calcifications (5). Because cardiovascular disease is the leading cause of death in young adults who initiated treatment for ESRD in childhood (10), maintenance of normal indices of bone remodeling and normal blood calcium concentrations may have important clinical implications. That treatment with active vitamin D sterols leads to similar reductions in bone formation and turnover despite the lack of substantial differences in serum calcium concentrations provides evidence for direct inhibitory actions of calcitriol and doxercalciferol on osteoblastic function as previously suggested (3,26,31,32). Furthermore, final serum PTH levels were consistent with skeletal findings of 2°HPT (19), mainly in patients who were treated with sevelamer. Calcitriol is an important direct regulator of bone formation and turnover, and Gonzalez et al. (33) demonstrated that in vitro exposure of UMR 106-01 osteoblast-like cells to PTH or calcitriol decreased PTH/PTH-related protein receptor mRNA in both a time- and a dose-dependent manner. Just as the actions of 25(OH)D3 require the formation of 1,25(OH)D3, the biologic actions of doxercalciferol are largely dependent on the formation of 1,25(OH)2D2 after 25-hydroxylation by the liver. Consistent with a potent bone effect in vivo, studies in ovariectomized rats have suggested that doxercalciferol directly reduced bone formation rate (34). However, in this study, the degree of suppression of osteoblastic activity is indistinguishable between both vitamin D sterols (data not shown), and the study was not powered to detect differences between the two vitamin D sterols. Our results provide further evidence that calcium supplements, when combined with active vitamin D sterols, have an additional biologic effect on the control of 2°HPT (24). Indeed, while patients were receiving 2.9 ± 0.2 g/d elemental calcium, there was an early and steady decline in serum PTH and alkaline phosphatase levels that was coupled with concurrent increments in serum calcium concentrations, more frequent hypercalcemic episodes (>10.2 mg/dl), and increased calcium-phosphorus ion product. In contrast, during therapy with sevelamer, reductions in PTH and alkaline phosphatase levels occurred largely during the last 4 mo of the study, when patients received the highest doses of calcitriol and doxercalciferol without increments in serum calcium. The delayed reduction in PTH levels during sevelamer therapy thus may be due primarily to the effects of active vitamin D sterols on PTH gene transcription (35,36) and parathyroid cell proliferation (37), which seem to take longer than the more rapid inhibitory effect of calcium on PTH synthesis and secretion (38). Furthermore, with sevelamer therapy, it was possible to increase the dose of active vitamin D sterols, thereby maximizing the efficacy in the reduction of PTH secretion without leading to increased intestinal calcium absorption (39). Overall, serum calcium levels were only 0.63 ± 0.22 mg/dl higher in patients who were treated with calcium carbonate, but the resulting mean increase was shown to carry a relative risk for increasing vascular calcification that is equivalent to 2.5 yr of hemodialysis (40). The relative mild increase in serum calcium concentration, however, may underestimate the frequency and/or the magnitude of transient hypercalcemia after calcium carbonate ingestion. Inconsistent changes in serum bicarbonate levels have been described during therapy with sevelamer (14,15,41,42), but the potential development of metabolic acidosis may affect growth potential in children (43). In our study, serum bicarbonate levels were on average only 2 mEq/L lower in the sevelamer group compared with calcium carbonate, but the skeletal lesions of 2°HPT markedly improved. In contrast, a more severe degree of acidemia was associated with persistent skeletal lesions of 2°HPT in patients who were undergoing hemodialysis (44). Treatment with peritoneal dialysis may have an additional role in the prevention of metabolic acidosis in our study (45). However, Brommer et al. (46) demonstrated that bicarbonate levels between 21 and 22 mEq/L were associated with better nutritional status and lower relative risk for mortality than those with predialysis bicarbonate levels within the normal range or with severe acidosis. Net intestinal calcium absorption is reduced in patients with chronic kidney disease as a result of both reduced dietary calcium intake, as demonstrated in our study, and decreased fractional intestinal calcium absorption (47). Only three patients in our study required calcium supplements for 4 to 12 wk because their serum calcium levels were <8.2 mg/dl. Thus, the total calcium intake should be monitored carefully when long-term therapy with sevelamer is given to pediatric patients who undergo dialysis, because total skeletal calcium in healthy children increases substantially from childhood to adolescence (48). The results of our prospective, randomized study demonstrate that therapy with active vitamin D sterols combined with either calcium carbonate or sevelamer can efficiently control serum phosphorus levels and the biochemical and skeletal manifestations of 2°HPT, particularly when a dynamic approach is used for adjusting the doses of active vitamin D sterols to target levels of serum calcium, phosphorus, and PTH. By the end of the study, indices of bone formation and turnover were within the normal range in the vast majority of patients, and the development of adynamic osteodystrophy had been prevented. However, therapy with sevelamer widened the safety margin in treating 2°HPT with active vitamin D sterols by maintaining serum calcium levels within the lower end of the normal physiologic range as recently recommended (11). This work was supported in part by U.S. Public Health Service grants DK-35423 and RR-00865 and funds from the Casey Lee Ball Foundation. Bone Care International kindly provided doxercalciferol (Hectorol) and unrestricted support for this study. The data reported here were presented at the meeting of the American Society of Nephrology, St. Louis, MO, October 2004. We thank Dr. Allen R. Nissenson for critical review of the manuscript.